LASIK (Laser-Assisted-In-Situ Keratomileusis) is an elective outpatient surgery which is used to treat nearsightedness, farsightedness, and astigmatism. An excimer laser is used to gently reshape the the surface of the eye (cornea) to improve one’s vision without the use of glasses or contact lenses. Our doctors are experienced, trained, and certified in traditional microkeratome (“Blade-based”) and Intralase (“Bladeless”) techniques as well as surface ablative procedures (PRK – PhotoRefractive Keratectomy). 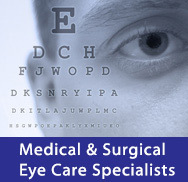 We now also offer “Custom” LASIK to optimize the visual results using advanced imaging and laser technologies. A patient interested in laser corrective eye surgery undergoes thorough testing utilizing noninvasive imaging techniques and medical evaluation of the eyes to evaluate one’s candidacy for the procedure. The results of this testing will then be reviewed in detail by the doctor with each patient to determine the best procedure for each individual.